Comes with additional BLACK+DECKER eb-007 edge Hog heavy-duty edger replacement blade. LE760FFAM is a kit that includes the LE750 Edger and the EB-007 Replacement blade. 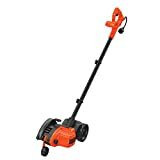 The BLACK+DECKER LE760FFAM 12 amp 2-in-1 landscape edger & trencher features a 12-amp, high-torque motor that helps this electric landscape edger power through tough overgrowth & dig clean-looking trenches. Easily converts from edger to landscape trencher. Comes with additional BLACK+DECKER eb-007 edge Hog heavy-duty edger replacement blade.